As it is for many graduate students at EMU’s Center for Justice and Peacebuilding, the required capstone project was more than just an assignment for Bishop Andudu Adam Elnail MA ’18. This Sudanese Episcopal bishop in exile experienced his work as an important part of a larger journey of helping his wounded people to heal from decades of pain and trauma. Bishop Andudu Adam Elnail discusses his work with Sudanese and South Sudanese refugees in cities across the United States. Andudu had been working on issues related to trauma and resilience and restorative justice among the Sudanese refugee community in the years before coming to study at CJP. His travels in his role as bishop of the Diocese of Kadugli of the Episcopal Church of the Sudan have taken him to 35 states. He has found that the journeys of Sudanese refugees are rarely the same: approximately 50,000 are living in communities across the United States, many arriving by way of other countries, such as Kenya, Uganda and Egypt. But they also have much in common. The families of many – including his own – are often dispersed to distant lands, and many have little hope of returning to their homeland. They also face similar difficulties as they try to recover and adjust to a new life and culture. “Most of them have trauma, fear and aggression when they come here, which causes divisions in their family, in church and in the community,” he said in a recent presentation at EMU explaining his work and future efforts. For his capstone project, Andudu organized and facilitated a series of workshops in communities of the diaspora in Dallas, Texas; Richmond, Virginia; and Denver, Colorado. The workshops were designed to educate and build awareness among Sudanese immigrants, church and community leaders about the concepts of trauma healing, restorative justice, mediation and negotiation. Fellow CJP graduate Kajungu Maturi MA ’18, of Tanzania, was among the instructors he asked to join these efforts. Andudu first came to the United States in 2011 for medical care – a need that may have saved his life. Shortly after he left, Kadugli’s All Saints Cathedral, the rest of the church complex and his own home were attacked by government of Sudan militia forces. He later learned he had been placed on a death list. 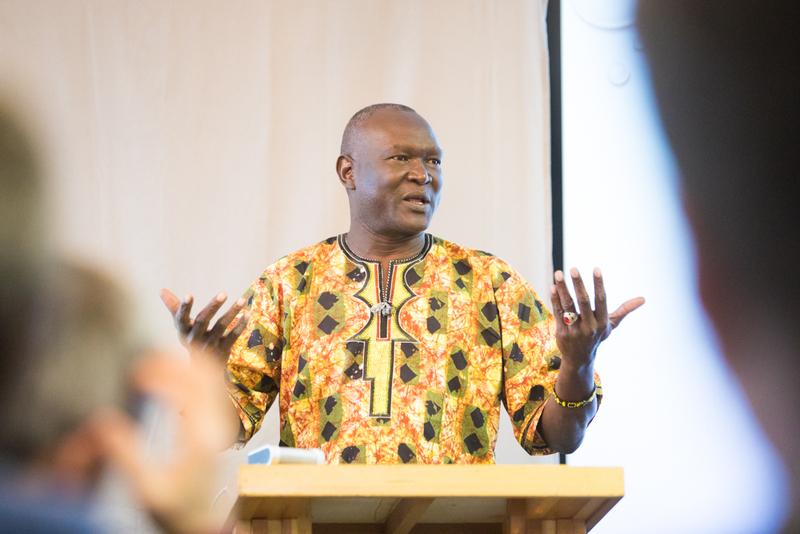 Granted asylum in the United States, Andudu now works from the United States and a liaison office in Juba, South Sudan, to pastor his dispersed congregation. Church leaders and congregants of the Kadugli Diocese are residing in exile, mostly in refugee camps in six different countries: Sudan, South Sudan, Kenya, Uganda, Ethiopia and Egypt. Meanwhile, the people of the Nuba Mountains, along with areas of Abyei, Blue Nile and Darfur are caught between the governments of North and South Sudan and suffer from raids, bombing and starvation. 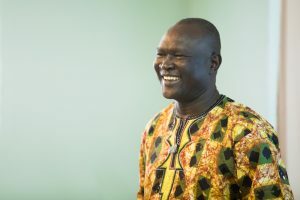 Andudu has filled varying roles with his peacebuilding and advocacy work. He chairs the Episcopal Interfaith Committee for the South Kordofan region and for all Sudan, as well as the Committee of Peace Experts. In 2012, he spoke at a Council on Foreign Relations event in Washington D.C.
He’s also been a participant in peace talks between the Government of Sudan and Sudan People’s Liberation Movement in 2012-2014, as one of 24 expert members of negotiating team. Diaspora communities are challenged in many ways, he said. One common conflict shared across all the refugee communities Andudu visited is the significant challenges of negotiating traditional Sudanese cultural beliefs in the new American culture. For example, men traditionally hold power but this status is challenged by women who have observed more equality between the sexes and desire more power in decision-making. Those who are parents also are challenged by different cultural expectations for their children. Learning new ways to resolve conflict and how to choose between violent and nonviolent actions are important lessons for Sudanese, whose culture is tribally oriented and highly patriarchal. Neutrality, he added, is a difficult concept to introduce, as loyalty to family and tribe is a high priority in Sudanese and South Sudanese culture. With his master’s degree finished, Andudu can now focus wholly on his church leadership role. In that capacity, he plans to work with CJP to host more workshops and to encourage Sudanese and south Sudanese community leaders to gain more training at the Summer Peacebuilding Institute. The same blessing might be said of his own work. Ofеnsywa nawiązała się przed północą. Thank you Bishop Andudu for your great work! South Sudanese and Sudanese communities need some committed citizens like you to deliver them from cycles of violence and victimhood they’d been into for so long. Our work is available. I am glad meeting you at SPI. You’re a great person and I know together we can do a lot.